Tiziano Vecellio, known as TITIAN, is generally regarded as the leading painter of the Venetian school. As noted by Umberto Fortis in The Uffizi: A Guide to the Gallery (Venice: Edizione Storti, 1980, p. 85), "[T]he classicism of the Veneto did not find its fundamental expressive force in the use of line to create its images, but in the development of tonal painting, creating noble forms of a solemn plasticity to attain, with Titian, an ideal of ample, monumental beauty, yet anchored firmly in earthly reality." Some of Titian's most acclaimed works of the ensuing ten years were the Assumption for the Church of S. Maria Gloriosa dei Frari (1518) (in which the soaring movement of the Virgin is said to anticipate the later Baroque period), three paintings for Alfonso d'Este in Ferrara (the Worship of Venus, the Bacchanal and Bacchus and Ariadne) (1518-23), an altarpiece in Ancona (1520), a polyptych in Brescia centered on a Resurrection of Christ (1520-2), and the altarpiece for the Pesaro family side altar in the Church of S. Maria Gloriosa dei Frari (1519-26). Later Titian's work became more heavily weighted toward portraiture. Young Giorgio Cornaro (H-4) was one of his subjects in a 1538 painting. Among other prominent subjects were Pope Paul III (1546) and Charles V (1548), Emperor of the Holy Roman Empire. 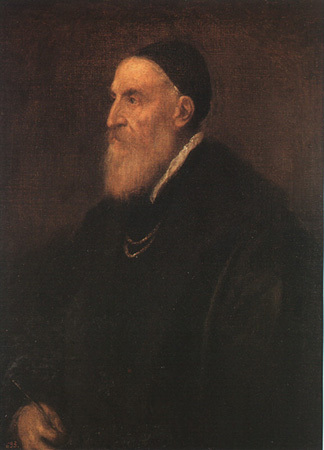 The Emperor appointed Titian court painter and gave him the rank of Count Palatine and Knight of the Golden Spur. In the 1540s Titian's work became more heavily influenced by the Mannerism of central and north Italy. He travelled to Rome in 1545-6 for his only visit there. In 1550 he was in Augsburg to paint portraits of Emperor Charles V's son, who was to become Phillip II of Spain and an important later patron of Titian. A detail from his 1567-8 self-portrait, now at the Prado, Madrid, is shown above.